Dr Ronald Elmer Batt died 25 April 2017 aged 83 after a prolonged illness. He is survived by his wife Kathleen, 12 children and step-children; 31 grandchildren and step-grandchildren; 6 step-great-grandchildren; and his sisters Norma Hinchy, Eileen Batt, and Phyllis Kavanaugh. Ron was a friend to all, a scholar, a scientist, an historian, and a wonderful clinician. He will be missed by many including those who study or treat endometriosis and who continue to benefit from his contributions. Professor Maurice Bruhat was also in Beijing and invited him to the First World Congress on Endometriosis in 1986 in Clermont-Ferrand, France. In Clermont-Ferrand, Ron presented “Duplications of the Müllerian System and Pelvic Endometriosis”. He enjoyed friendship, intellectual curiosity, and professional expertise through his many years of attending the World Congress on Endometriosis (WCE) meetings. He also used those meetings as opportunities to lead friends and family on tours of WW-II battlefields in Belgium, shrines in Kyoto, civic celebrations, a kangaroo farm, and an unexpected breakfast with Gene Simmons of KISS in Melbourne. Ron had three funded medical history projects, including the 2004–2005 ACOG Ortho/McNeil Fellowship in History of American Obstetrics and Gynaecology. He entered graduate school with an emphasis on the history of medicine after retiring from medical practice. He drew on his lifetime of experience and study of endometriosis in his doctoral thesis “Emergence of Endometriosis in North America: A Study in the History of Ideas’’ (State University of New York at Buffalo, 2008). Dr Batt focused on the need for attention to detail when studying definitions and concepts of a specific historical era. He noted that definitions can vary during any period and change over time. His doctoral thesis was expanded into A History of Endometriosis (Springer-Verlag London Ltd, 2011). 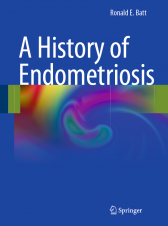 A History of Endometriosis covers the development of anatomic and clinical science leading up to von Rokitansky’s description of endometriosis in 1860 and subsequent developments through 1946. It chronicles the contribution of Johann Wolfgang von Goethe, Immanuel Kant, Carl von Rokitansky, Friedrich von Recklinghausen, William Russell, Thomas Cullen, H. Futh, Cuthbert Lockyer, DB Casler, John Sampson, and the many others who were part of this story. Ron donated his royalties from “A history of endometriosis” to the World Endometriosis Society so that WES might provide travel grants for young people to attend the world congress on endometriosis. Before his illness, Ron focused his research on the history of endometriosis since World War II; the life and research of Kornel Ludwig Terplan MD, professor of pathology at the University of Buffalo from 1933 to 1960; male endometriosis; and the pathogenesis and pathophysiology of the four acquired and four congenital müllerian diseases: adenomyosis, endometriosis, endosalpingiosis, and endocervicosis. Ron is missed by those who had the privilege and pleasure of knowing him. We have lost not only a respected and thoughtful member of our community, but also a committed scholar and scientist.